We here at Green Flower believe it is the obligation of members in the emerging cannabis industry and cannabis reform movement to be responsible stewards of the cannabis plant. The stigma against cannabis remains very real when people are still afraid to talk to friends or loved ones about the plant’s therapeutic potential. We want to highlight and thank some of our favorite companies and organizations out there working to spread the truth. 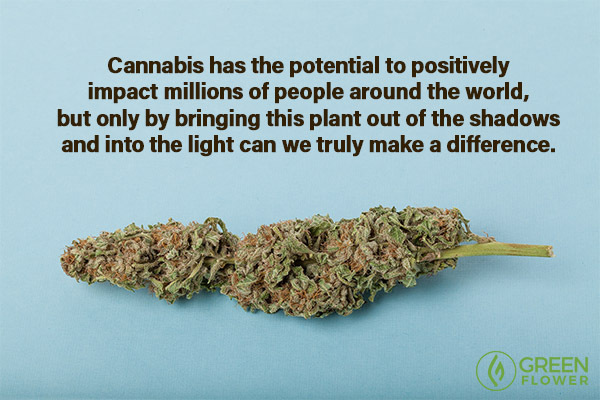 These groups are just a small fraction of the larger movement of people who have come together to create unprecedented change, get proactive about cannabis education, and leave a positive impact! NORML is the oldest cannabis reform organization in America. NORML has worked for decades to move public opinion sufficiently to legalize the responsible use of cannabis by adults. NORML serves as an advocate for responsible adult cannabis consumers to assure they have access to high quality cannabis that is safe, convenient and affordable. NORML also supports the legalization of hemp (non-psychoactive marijuana) for industrial use. Essential Oil Testimonials maintains the most comprehensive list of essential oil testimonials on the internet, and has since 2004. Registered members of Essential Oil Testimonials can conduct their own keyword searches within the vast database of nearly 10,000 testimonials. It is a tremendous resource that people can use to find out more about using essential oils, and to share their own experiences. Erin Frost, eFrost.net, has been connecting advocates and helping others in the cannabis community for several years. With the help of social media, she has become a leader & influential voice in the cannabis culture. Erin is the creator MMJ Billboard & World Treez, founded to share solutions & spread awareness. Erin wholeheartedly believes the future depends on us! Get informed. Be the change you wish to see! Learn how to use your voice – for even though you are just one person, you can have a huge impact! Illegally Healed provides relevant content related to cannabis science, patient testimonials, and medicinal cannabis news. Illegally Healed does an outstanding job of educating readers about the full healing capabilities of cannabis, enabling thoughtful discussion and encouraging powerful activism. Illegally healed is followed by many cannabis activists within the United States and internationally. The Herbalizer is the world's most technologically advanced vaporizer. All Herbalizer vaporizers are proudly made in the United States (not many vaporizer companies can say this). Herbalizer is highly motivated to raise awareness of vaporization's benefits through precise, controlled herbal extraction, or as they like to call it, 'Relief by Design.' The Herbalizer was engineered to simplify, and dramatically improve the perception and process of vaporization. DOPE Magazine is one of the most exciting and rapidly growing cannabis media outlets in America. DOPE Magazine is a print and online lifestyle publication dedicated to bringing an intelligent and creative approach to the many facets of the cannabis movement. DOPE Magazine provides readers with breaking news, celebrity features, strain reviews, daily blogs, and much more. DOPE Magazine is distributed nationally for free. Ganjapreneur is a leading online cannabis industry media outlet. Ganjapreneur is dedicated to keeping readers up to date on the latest opportunities and developments related to the cannabis industry. Ganjapreneur's mission is to provide unbiased, in-depth coverage with an emphasis on the daily struggles of cannabis industry pioneers who are paving the way for future generations. When it comes to keeping up on the cannabis industry, visiting Ganjapreneur.com regularly is a must. Civilized is a media company that entertains, informs and engages its audience with insightful editorial and commentary, in-depth interviews with celebrities and legislative game-changers, as well as pop culture updates, trending news and entertainment coverage. Capitalizing on a major social shift across North America, Civilized has identified and effectively reaches a high value audience that was previously untapped: millions of motivated, productive adults who choose to enjoy cannabis responsibly as part of a balanced lifestyle but are not defined by it. The Joint Blog is a very popular cannabis news and information website, and has been spreading cannabis awareness for many years. The Joint Blog is ran by hardworking cannabis activists seeking to end cannabis prohibition. The Joint Blog has created several successful cannabis related petitions. Are there other companies you’d like to share? Please feel free to add your comments below and tell us what you love about that company! What type of cannabis organizations appeal to you most?